I've known about the mystery, beauty and ancient history of Bagan for a few years now. I'd only ever known someone who'd been there in the past couple, and when Andrea informed me that seeing the sunrise hot air balloons there was on the top of her bucket list, it became a real goal of mine to see them as well. The city boasts thousands of pagodas, some tiny crumbling brick pagodas, others gold meccas calling to tourists and monks alike. 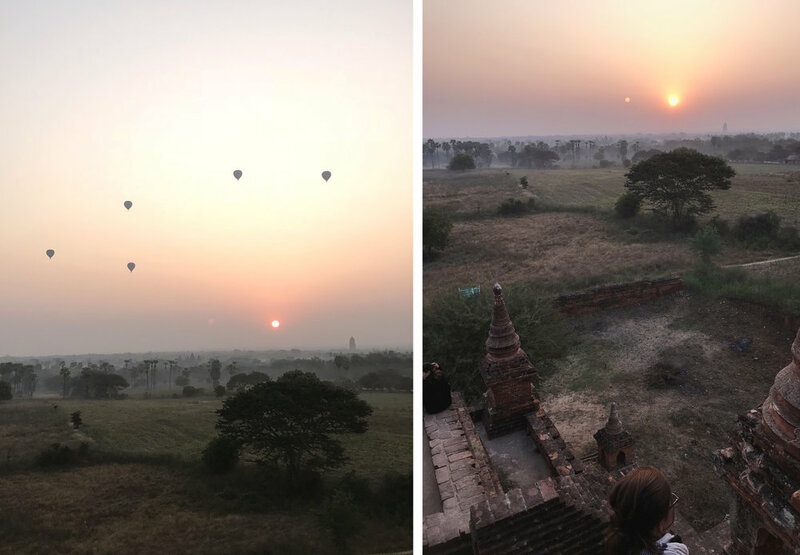 Expectationless, we planned to spend almost three days in Bagan, including two sunrises and two sunsets. four chances to find the beauty so many sought in traveling to the archaeological zone. We left Chiang Mai in the afternoon and took a tiny tiny plane to Mandalay, where we were barely able to get fresh air before we were ushered to a taxi (with all the nerves you can possibly imagine) by a local with incredibly clear english, driven by a local with incredibly minimal english. Our three hour drive to Bagan was quiet, dusty and dark. Watching our GPS clearly to make sure we were going in the correct direction, my "Asia-guide" disguise was quickly crumbling down around me. Around midnight, after a little dozing and a ton of jolting and plenty of prayers, we pulled into our hotel in Old Bagan, Bagan Thande Hotel. We paid our driver probably way more than he was expecting (but really we could never repay him for driving us through pretty much half of the country), and we followed the kind staff to our room. We couldn't tell then, but the view from our room rivaled any I'd seen in Southeast Asia so far. We started later the next morning, preferring to get some sleep after our bumpy taxi adventure. Our hotel was right next to Gawdawpalin Temple, so we started close by, loving the white-washed stone and the morning light flooding into the building and across the floors. It was quiet–eerie at times, but more so peaceful, you could hear a lot of the sounds from the world still waking up, the rustle of leaves across the tiles and the call of tropical birds you could never actually see. We saw several pagodas that day, the most impressive of which were Dhammayangyi, Shwesendaw, and Ananda Temple. We ran across a few crumbling pagodas, and a lot of the temples we were told had great views were under construction due to some earthquakes that had hit in the last couple of years. We rented e-bikes from the hotel, and I quickly volunteered to be the navigator, switching between Heather and Andrea's bike as each of them grew tired of toting me around. The sandy paths (and herds of cattle) made traveling around town difficult at times, but I can say with 100% confidence that these ladies are now pros at mopeds in Asia. No one got injured, but Andrea had a few hand cramps from gripping the handlebars with all the force of the Hulk. Because of the long list of temples closed for repairs, we ended up finding a rather large group of tourists waiting on a tall hill for sunset. Because the sun would be just as beautiful whether we were with a huge group or not, we decided to join, and we were rewarded with a hazy, picturesque view of all the layers of Bagan. The temples and plains stretched for miles, and the feeling of being so small came quickly, as awe-inspiring and (un)comfortable as ever. With all the construction going on, we asked a new friend who worked at Bagan Thande where we should go for the sunrise. He mentioned Shwe Leik Too, a tiny little brick pagoda that hadn't had any damage from the earthquakes. We left the hotel before any light was in the sky the next morning, the bike ride there was absolutely freezing compared with the hot afternoons we'd been sweating in the days before. We arrived at the pagoda, and per the instruction of a hastily translated sign out front, left our Chacos at the front arch and proceeded to wander the grounds, searching for a way up to the top levels. In and out, we didn't find any stairs and we were worried we'd need to find an alternate watch spot (which we had not even thought about). Less than a minute later, we saw a flashlight burst from the second level of the pagoda and checked the inside of the building again only to find the tiniest little crawl space staircase to climb up. We made it up three levels and perched on the sides of the stupa, waiting for the pink of the day to arrive (and also the forty other tourists who joined us, including an entire business meeting, suits and ties and all). Our Thande friend had neglected to mention that Shwe Leik Too was directly in front of the hot air balloon launch site. After a while I had to set my camera down and just enjoy the moment, seeing the dawn creep over the horizon and the balloons launch off to mingle in the sky like they'd stay there all day. The entire event was about two hours, our feet chapped and numb from the cold and the wind, our butts sore from the edges of the brick. Breathless from the beauty of the morning, we reluctantly made our way back down to the ground, shimmying through the little staircase to the solid and welcoming dirt. We made a few friends who asked us for some photos and took a few in turn for us, reminded of how travel connects all cultures and the kindness we all long for. Being around all of the temples and religious symbols was sure to bring up a lot of memories and questions. We chatted together about the meaning and confusion behind a lot of Buddhist traditions and rituals. In the past, exploring and visiting temples hasn't really brought up much emotion for me, they represent more history and culture for me than anything else. I do remember a time before Bagan when a friend and I visited a temple city in Thailand, which left me feeling sad and empty. The darkness that place had cast over our time there was jolting, the sense that thousands of people were casting their lives and their hopes before a person and a lifestyle that led them to nothing but a grace-less striving. Bagan had a similar feeling in a few moments, but the throngs of tourists and the spirit of the people we encountered during our time there mixed that feeling with something a little lighter. A heavy place to be, but a reminder that the Lord is at work creating love and grace in the places that seem to be completely lost to his touch. After we cleaned up from our dust and grime of the morning, we set off to explore New Bagan the city-esque part of the area. We found lunch at the Moon 2, where our server blew us away with his perfect English, and we were equally blown away by the ginger-honey-lime smoothie. 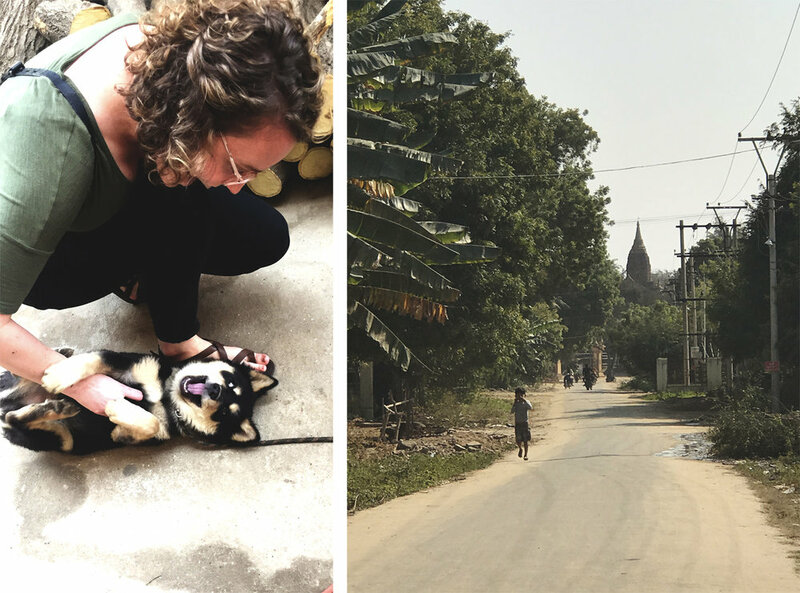 We headed to Lawkanada Pagoda, where we relaxed around a little market on the banks of the Irrawaddy River, and also where I got pooped on by a bird. They say it's good luck? Whoever "they" is. We made a few animals friends outside a laquerware workshop and were grateful for a few hours to laze around the hotel and enjoy a sunset glass of wine by the riverside before our 10-hour, very bumpy bus ride to the capital. Thanks for the bucket-list memories, Bagan. Bangkok, the bustling capital of Thailand, with 8 million residents (and another 8 million undocumented), countless skyscrapers and a thousand different rhythms of life. 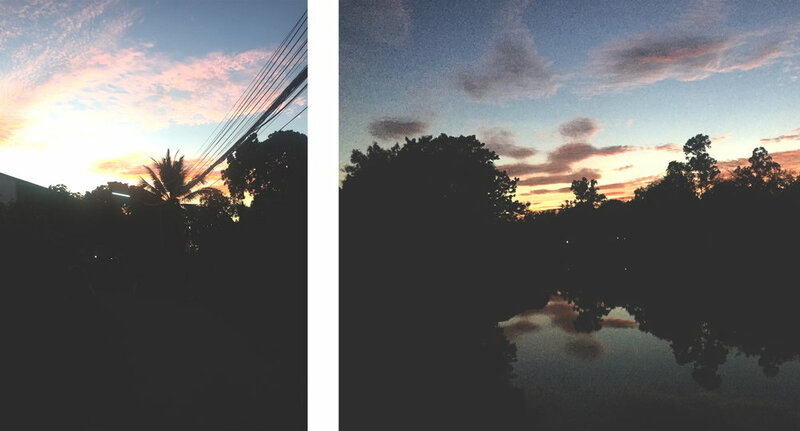 In the time I've lived in Chiang Mai, I went about six different times. Each time I didn't bring my DSLR, and really that is so indicative of the culture of Bangkok, selfies and Instagrams and everything mobile. After all, Siam Paragon is the most Instagrammed place in the world. The first trip began with an overnight train ride, ending with another overnight ride, but a bus that time. Both are affordable (less than 500 baht) ways to get to the city, but when flying only takes an hour and sometimes you happen upon amazing AirAsia promos for a $20 round trip ticket, I would just recommend flying. Katie and I truly experienced Bangkok tourism when we went for a weekend this past May. We arrived via Nok Air later that night and navigated the trains and streets in the rain. Rainy season in Bangkok is incredibly humid, unforgiving, and full of sudden puddles in the sidewalks. Beware of splashes, and expect crowds in the walkways, everyone's trying to stay under some sort of awning, and there usually isn't a clear pathway to your destination. Because we were expats living in the country, we knew some good friends in the city or visiting from other parts of the world, and usually stayed with them. The last two visits, those friends had left for adventures elsewhere in the world, so Katie and I opted for Cacha Art Hotel, a hip boutique hotel close to the Siam area, and on my last trip I chose an unassuming guesthouse tucked away on Sukhumvit Road called the Johnson House. If there's one thing I love about any given city, it's the public transportation. Bangkok being as big as it is, there are loads of different methods to get around. You have taxis (50-500B depending), motorcycle taxis (20-60B), the bus system (2B per stop or a fixed 30B), the river taxis and ferries (3B-200B) and then the metros. Bangkok has a Sky Train, called the BTS, and a subway system, the MRT. Both service different parts of town, and remain surprisingly clean. I would recommend getting a Rabbit card near the beginning of your trip and sticking to using the BTS and motorcycle taxis (or regular taxis if you're not a fan of those). Some of my favorite moments have been traveling back to the airport from a weekend in the city, standing on the crowded BTS just reading in the middle of it all. If Chaing Mai had a metro system, I'd be in heaven. The first stop Katie and I made was to a great restaurant recommended to us by the owner of one of our favorite cafés in Chiang Mai. Karmakamet is an oasis all its own, with an impressive menu of cuisines from all over the world, a beautiful drink menu of mocktails, cocktails and odds & ends. The atmosphere had us at first sight and we made another trip back later in the weekend. The number of great food establishments in Bangkok is staggering at best, something new and delicious on every corner. Unfortunately I didn't document each place that I ended up going across the two years of sporadic visiting, but I'll tell you for sure that I remember each one. BKK Bagel Bakery was one of our first stops on our exploration day back in May. We'd stumbled upon an article online claiming it as the best bagel shop in town, and it didn't disappoint. The cream cheese was different, having a little bit of a sour taste to it, but I loved it and would have eaten bagels all day if we didn't have other plans. Another great spot for breakfast food is The Corner, a French café I'd visited with a friend the fall before. The omelette I ordered was big and full of vegetables, but the price was friendly. For lunch Katie and I visited Counting Sheep Corner, an adorable spot I'd been to with Jackie, our friend who teaches in Bangkok, a few visits before. The place is eclectic, with loads to look at, listen to and take in. The sandwiches are incredible, and I remember loving the spicy nachos the first time. It's a short walk away from the Ekkamai BTS station and is close to several coffee shops that make a great cap on a meal. Another great lunch spot is Casa Lapin, where I ordered a Croque Madam and wondered what I'd been doing with my life only ordering Croque Monsieurs. I visited the x49 location on my last solo trip to Bangkok and was highly impressed with their flat white (which has become my go to drink to figure out if a place is hi-so enough). 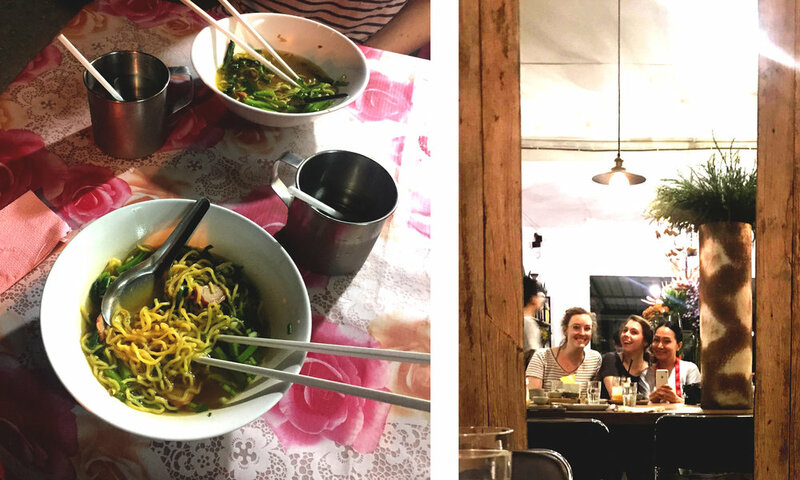 Though different from the traditional (and delicious) food stalls that line almost every soi in the city, Bangkok's plethora of cafés and superior restaurants are heaven for the foodie traveling through... and that's us. One place I was taken for a meal by a Thai friend was called Kab Khaw Kab Plaa, which means "rice with fish." I've been a little hesitant about seafood in Thailand from living in Chiang Mai, but this was some of the best I've ever had: crab fried rice and spicy shrimp salad. It was worth a go and super cheap. In addition, there is no lack of amazing coffee spots, and we were able to go to some of the best. Ink & Lion Café impressed us, with a quiet work atmosphere and delicious goodies to accompany the coffee. It's tucked away in Ekkamai again, close to an area that is up and coming with loads of new eateries. Rocket Coffee Bar has several locations, and I found its smallest on my last round in the city before hitting the BTS for the airport. The place takes a lot of pride in the craft of its Nordic style coffee, and it's apparent in the presentation and setup of its different locations. The baristas are often in the middle of everything, where guests and coffee drinkers can watch how they pour and pull with finesse. The menu is pretty extensive, and the place is just as good for the coffee connoisseur as for a bite for lunch. I would be hard pressed to say what restaurants are my favorite in Bangkok, but I think I could narrow it down to two. Katie and I visited Peppina, a delicious pizza dive and I loved it so much that I went back alone, which, if you know me, you know is a big deal. We ordered a truffle pizza and starters like zucchini-wrapped fritters. The place also boasts an extensive drink menu and offers cheeses from all over the world. The other place I would name is Roast. This place has the best breakfast I've ever eaten in Thailand, and the pancakes are way better than any I've had... period. The vibe of the place is organized and fresh, a perfect way to start a calm morning, which I had done twice now and it's not enough. Roast forever. The last coffee shop on our café hop in May was Ekkamai Macchiato (can you tell that that part of town has some really great stuff in it?). Tucked away in a neighborhood looking like a regular old modern house, Ekkamai Macchiato is white brick heaven on the inside, with lemonades and refreshers to quench your palate after the heat of the city, but great coffee for those who need a pick me up, again probably because of the heat. 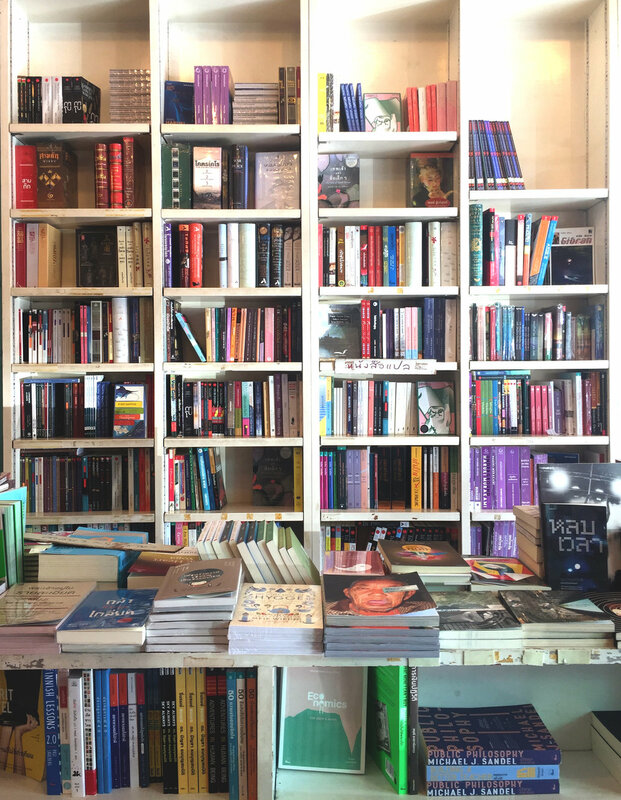 After our first time in Ekkamai, Jackie and I wound our way (the soi truly is a maze) to Phil Coffee, where we sat and lazed and read for a while before talking to the baristas about the cuppings and beginner classes that take place at their hidden garden shop. Just like in other parts of Southeast Asia, Bangkok is full of malls, you're often not too far from one. They're sneaked in between the skyscrapers that have tourists gaping up at all times, and are where people go for just about everything: food, A/C, concerts, games, movies, exercise... seriously. Katie and I visited EmQuartier for tea and a movie afterward, killing time before our return flight that afternoon. You've got MBK, the place for everything you'll ever need to buy, and Terminal 21, a travel themed mall with amazing restaurants on every level. It's never ending. The thing I love most about the city itself is how different the character of each neighborhood is. I couldn't point out which was which, but in all the times I got to visit, it was clear that they were all very different. The art in some places, the concentration of businesses and commuters in the next. Some were full of food stalls and motorcycle taxis only, others were quiet and reminded me of a little Penang. 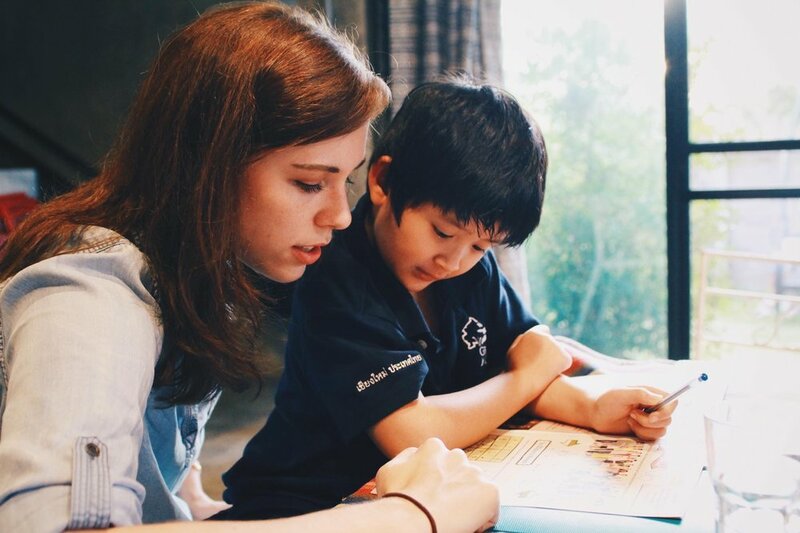 Katie and I will tell anyone who asks: you go to Chiang Mai to get "Thai culture." That isn't to say you can't find it in Bangkok, you surely can. In Chiang Mai it's a little more on the surface of things, and easier (read: less expensive) to navigate and you get the whole package. In Bangkok you have several famous temples and the Grand Palace. The palace is an extensive and immaculate complex of temples and shrines, lain with beautiful tile and stone, decorated with years of timeline murals describing Thai and Buddhist history throughout the centuries. Beware while commuting the the palace that you don't listen to any taxi drivers who tell you they teach at the palace and they have a great tourist deal for you, it's a scam. They'll try to tell you the palace is closed today (it's never closed) and that they're your best option. Entrance fee is 500B, steep, but the place isn't somewhere you can just walk around the outside and get the same feeling. The other two temples that stick out among the hundreds in the city are Wat Pho, where the largest reclining Buddha resides, a whopping three stories tall. It's a little overwhelming. There's also Wat Arun, which is currently covered in scaffolding, but is a skyline marker for Bangkok, called the "Temple of Dawn." One of the main reasons that Katie and I went to Bangkok for a weekend was to visit a floating market in our country before we were running out of time. We settled on Taling Chan Floating Market, a small food market set in boats and flowing off docks for a few blocks. The largest floating markets that sell more than just food are upwards of an hour away from the city. The charm of Taling Chan was it's size and local feel, opening up with a small walking street before the docks begin. Damnoen Saduak Floating Market is the mother of Bangkok "talaat naam," or "water markets," and takes about two hours to get there from the city. Bangkok is big, bright and bustling. It was a friendly stop for layovers, a welcome difference from Chiang Mai for weekends, and served Katie and me well for our hi-so live-it-up weekend away. I love spending time here amidst so many, feeling small yet one of a kind. I know it sounds vague and cliché, but being alone in the giant swell of 16 million is thrilling, and being able to navigate the transport and get around with locals is one of the highlights of the entire time I've been in Asia.